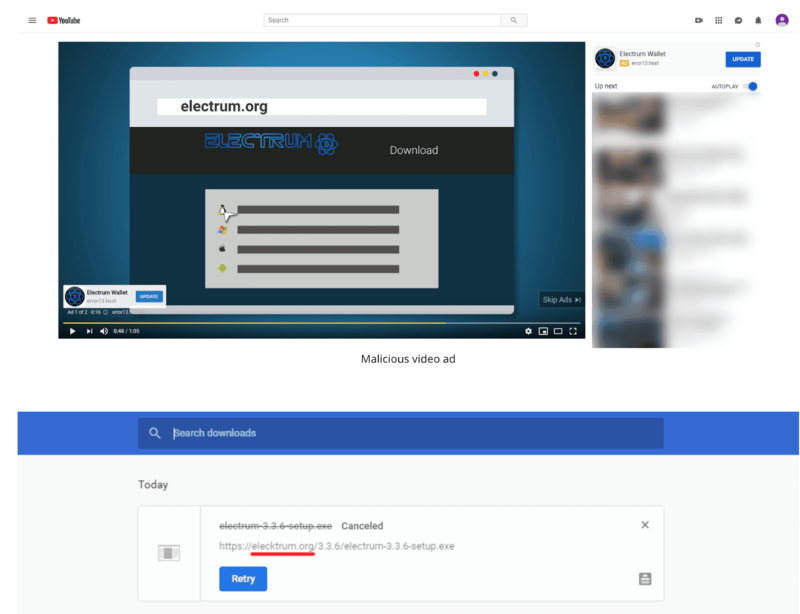 YouTube recently advertised the illegitimate version of Electrum, a Bitcoin wallet by mistake. Redditor spotted the malicious advert which was much like the actual Electrum advertisement. The correct link (electrum.org) is given in the advertisement but after clicking it, a malicious .exe file starts downloading instantly. It then redirects the users to elektrum.org, instead of the real link electrum.org, tricking users without getting suspicious (by just altering 'c' with 'k'). One of the most common scamming method typosquatting is used in which the original brand name or the name of the product is changed a bit to trap users by leading them to a malicious website. Redditor also pointed out that there was no easy way to tell Google about this malicious advert. But when the company was contacted by Thenextweb, the representative said that the report has been noted and thus adequate steps have been taken in this regard. Electrum and its primary website electrum.org has been misused by scammers multiple times. A year ago, a scammer bought a similar site which was almost like the original as electrum.com which claimed to provide the same services as the real Electrum. Soon company confirmed through Twitter that it did not belong to them and could be malware, stealing bitcoins. Soon after this, Electrum Pro also shut down its site and blamed the actual Electrum that it had ruined their name. It is a scammer’s job to scam, we have to be careful in the digital world.